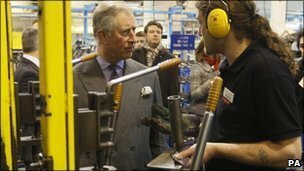 Click the Castleto find new or reconditioned stairlifts in Berkshire Today on visiting Stannah stairlifts Hampshire factory and headquarters HRH Charles Windsor the Prince of Wales apparently joked to staff that he knew who to call to get a complimentary lift in his old age. The prince supposedly said he was "reaching rapidly a state of decrepitude" and wouldn't mind trying a stairlift out. He also praised family firms, especially successful British ones. Well he may have spent time growing up in Balmoral Castle or Windsor Castle in Berkshire but we could speculate that it might be another Castle he would need if he ever retired to Windsor, Berkshire or neighbouring Hampshire and needed a stairlift. 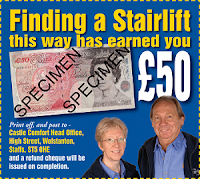 Yes, we would welcome a call from the Royal Household to this other successful family owned stairlifts business. For Stairlifts Berkshire from an approved Stannah partner Castle Comfort Stairlifts covers the South East including the Berkshire region for Stairlifts from their London office. The number to call is 0207 717 9797. Tally ho!